Thank you for your visit. 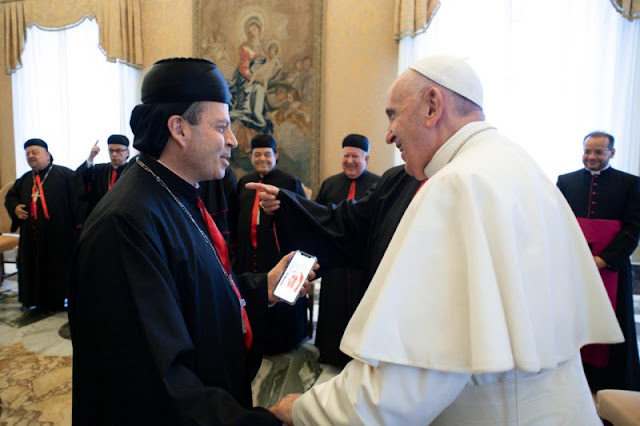 It is interesting what the Patriarch (Raï) said, that the ad limina visit is accompanied by the faithful. It's a good idea, it can be formalized, so they can bawl bishops! Can go! Thus we know the most concrete things of the community. This also reminds me of the miracle of the multiplication of the loaves, because they told me: "There will be about forty [people] to greet", but I have witnessed the multiplication of the Lebanese! But thank you for coming so many! Thank you. I would like to say thank you to the Lebanese community for all you do in Lebanon. For two things: keep the balance - this creative balance, as strong as the cedars - between Christians and Muslims, Sunnis and Shiites; a balance from patriots, from brothers. I thank you first of all for this. And I would also like to thank for something else: your generosity, your heart welcoming with the refugees: you have more than a million. Thank you, thank you so much! And now I will ask that the Lord bless you all. May the Lord bless you, your families, your country, your children, your refugees. Bless you all. Amen.